Special Invitation to the World Affairs Council, Let's get "Cooperized"! The DBC welcomes Drs. Kenneth and Tyler Cooper. In return, they invite DBC attendees to “Get Cooperized ™ " as their guests with Complimentary "3-Visit Passes" to the Cooper Fitness Center. Become a Platinum Member and meet them in person. Have you ever wondered where the concepts of Aerobic Fitness originated? Drs. Kenneth and Tyler Cooper would like for you to experience what it can be like with COMPLIMENTARY 3-Visit Pass to the Cooper Fitness Center for each event attendee. The passes will expire March 31, 2016. Dr. Kenneth H. Cooper, preventive medicine pioneer and “father of aerobics,” introduced the concept of exercising in pursuit of good health when he launched the world-wide phenomenon Aerobics in 1968—his first of 19 books on health and fitness. Dr. Cooper is founder and chairman of the renowned Cooper Aerobics Center in Dallas, the home of seven health and wellness companies and The Cooper Institute 501(c)3. His current focus is working to help reverse the childhood obesity epidemic through school-based physical fitness and nutrition programs and assessments. Tyler Cooper, MD, MPH, is president and chief executive officer of Cooper Aerobics Enterprises, Inc., and co-author of Start Strong, Finish Strong with his founding father, Kenneth H. Cooper, MD, MPH. He also practices as a preventive medicine physician at Cooper Clinic in Dallas and sits on the Cooper Complete nutritional supplements board of directors. It was his family’s commitment to maintaining a healthy lifestyle that shaped Dr. Tyler Cooper and led him to follow in his father’s footsteps. 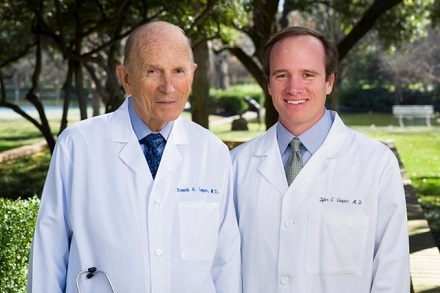 Like his father, Dr. Tyler Cooper’s professional and personal goals align perfectly. With his wife, Angie, and their children, Clark, Lang and Kai, his primary objective is to bring healthy living to the world and set an example by living the Get Cooperized™ lifestyle. Dr. Tyler Cooper has been instrumental in further developing the Cooper Aerobics business. He relaunched the direction of the corporate wellness business with the creation of Cooper Wellness Strategies in 2010, the same year he saw the opportunity to rebrand and reposition the Cooper organization. This led to the new tagline, “Get Cooperized™,” in addition to creating an updated logo and new visual architecture for the organization in 2011. Dr. Tyler Cooper oversaw all aspects of the recent Cooper Fitness Center (completed 2014) and Cooper Hotel (completed 2015) renovations to accomplish his goal to build a one-of-a-kind environment focused on the whole person—mind, body and soul. To quote Carl Sewell (Marquee Speaker in 2015): "Never, ever be satisfied with your level of performance. There is no choice but to improve." Clearly, the good folks at Cooper Aerobics Center feel exactly the same way. Registration will close at 5pm on February 22nd, 2016. Cancellations must be submitted by close of registration, 5pm, February 22nd, 2016 to receive a refund. Reception Service: Crab Cakes, Tuscan Empanadas (Beef, Chicken and Vegetable), Antipasto Cured Meats, Peppercorn Peppers, Mozzarella, Flat Bread Crostini, Italian Seasoned Vegetables and Fig Jam, Premium Roast Italian Coffee (regular and decaf), Iced Tea and Water.